Benin and Togo kind of sounds like a couple of Caribbean islands, but they’re two skinny countries sandwiched between Nigeria and Ghana. The influence of Christianity and English have seeped into these French-speaking countries, and drinks like Guinness and Milo are just as common here as in other former British colonies. They were important ports in the slave trade days, and the origin of Vodoo religion lies somewhere between these countries. I left Burkina Faso on a 15 hour bus from Ouaga to Cotonou, but 30 hours later I finally arrived the following morning. The bus had numerous reasons for being delayed, from the presidents presence blocking one road to waiting for armed military to board our bus and take the other road. I expected it to be a small-town kind of place, especially since Porto-Novo is the capital, but Cotonou reminded me of Phnom-Phen with all the hundreds of moto-taxis filling the large roads. I had couchsurf hosts in Fidjerosse, the sandy-lane suburbs west of the airport. One was a Dutch guy living with his Togolese wife, the other was a French guy living with his Cuban girlfriend. They’re homes were warm and inviting after the long journey, and I relaxed on the beach where I found some more ponies to ride. 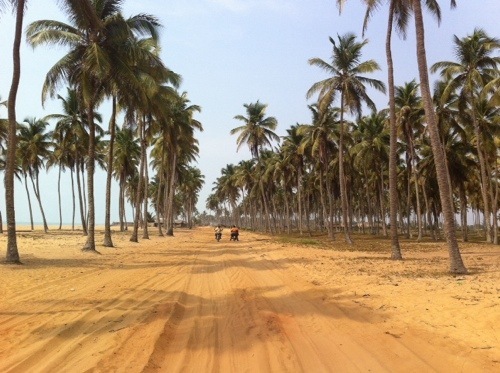 The beach in Benin is beautiful, the entire coast-line a stretch of yellow sand, palm trees and fishermen (minus the huge port in Cotonou). There is a famous road called the Route des pêches, a 50km sandy track where only motorcycles and 4×4’s pass, and I hitchhiked it all the way to Togo. 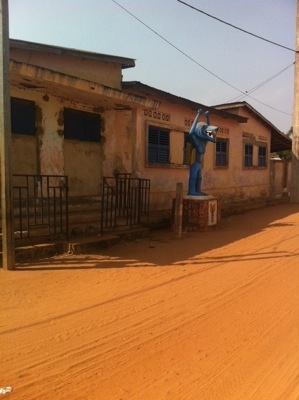 I stopped in Ouidah, the old slave port famous for its voodoo culture, and tried to make sense of all the colorful, cartoony statues that mark their superstitions and beliefs. There I picked up my last hitch-hike bike, whose driver didn’t speak French but was nevertheless road tripping through Benin to Ghana. I forget his name, but I’ll never forget his smiling face – he was a tall and lanky, gay comedian from Sierra Leone wearing a purple dress and long, painted nails to match. TIA, hey? Hi, just wanteԁ to say, I lоѵed this post.